The Little Chief Top Load Electric Smoker is our original line of electric smokers and a customer favorite since its introduction in 1968. 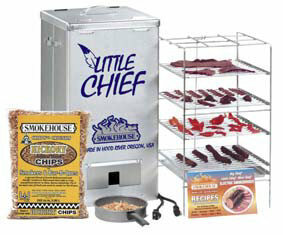 The Little Chief smokers are electric and plug into any standard 3-prong 110-120 AC outlet. The Little Chief heating element will heat the smoking chamber to approximately 165 degrees Fahrenheit. The Little Chief is perfect for smoking salmon, trout, other fish, jerky, sausage, fruits, nuts, cheese, turkey, bacon, hams, steaks and really any other types of foods. 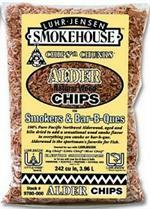 Why choose a Top Load Style over a Front Load Style Little Chief Smoker? The Top Load style is all about efficiency. All 4 cooking grills are held by the smoker rack, and can be removed with one motion. 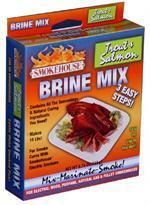 The Top Load Style is great when you are making large batches of the same type of meat, such as smoked salmon or jerky. 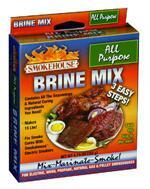 Electric cord, 4 Easy-Slide Chrome Plated Cooking Grills, Drip Pan, and Flavor Fuel Pan. Use 3-wire plug and cord with a properly installed ground fault interrupter (GFI) circuit. Use the Little Chief only on a concrete or other non-combustible surface, and use it at least two feet from any combustible materials. The Little Chief should only be used outside. 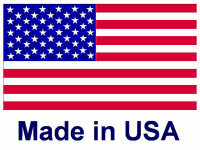 The Little Chief is Guaranteed to be free from manufacturing or component defects for a period of 2 years.